Kotak has introduced a new category of digital savings account named Kotak 811. We can open this account online instantly with Aadhaar Details at the comfort of your home without visiting branch, so how to open Kotak 811 Bank Account Online we will be going to explain in this article. To open Kotak 811 Bank Account Online first of all from your smartphone app store search for Kotak 811 and install it. Once the Kotak 811 App gets installed on your phone, just tap on the Kotak 811 Icon to open. Kotak 811 App will start loading, on first screen you will find get started now, so to open a bank account just tap on Get Started Now. On next page it will show benefits of opening Kotak 811 Bank Account so to proceed with creating a new bank account just tap on Get Started button. On next page you will have to enter your basic details like full name, mobile number and just tap on continue button. 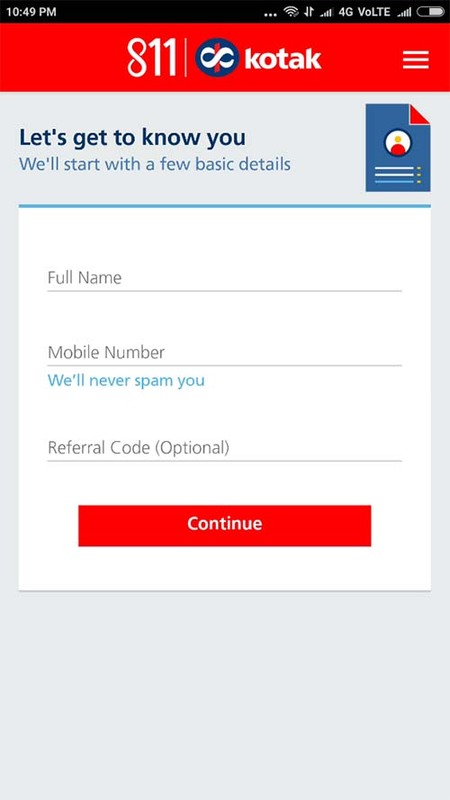 You will receive one time password on your mobile number via SMS, that code you will have to enter the enter otp here field and tap on continue button. 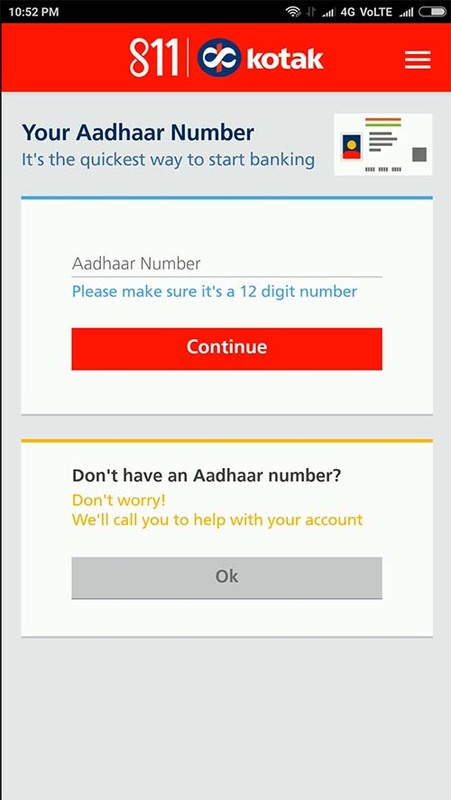 Next you will have to enter your 12 digit Aadhaar Number and click on continue button. 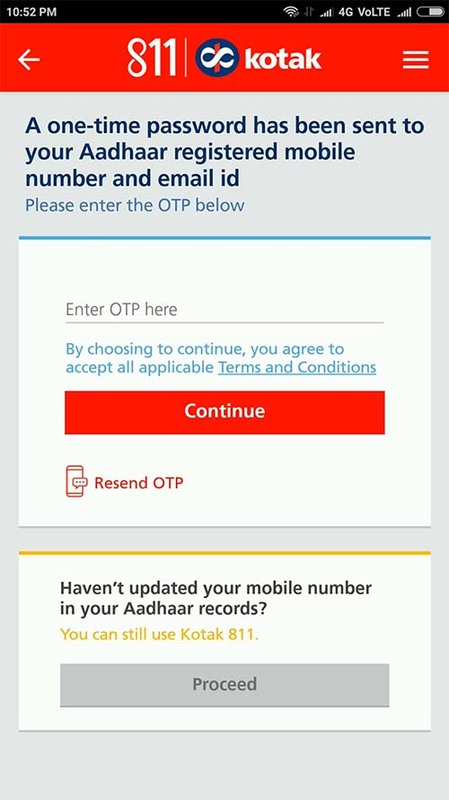 Again one time password will be sent to your Aadhaar registered mobile number and email id, you will have to enter the received OTP in enter otp here field and click on continue button. On next page it will fetch all your details with photograph from Aadhaar Database, if all details are correct just tap on continue button to proceed. 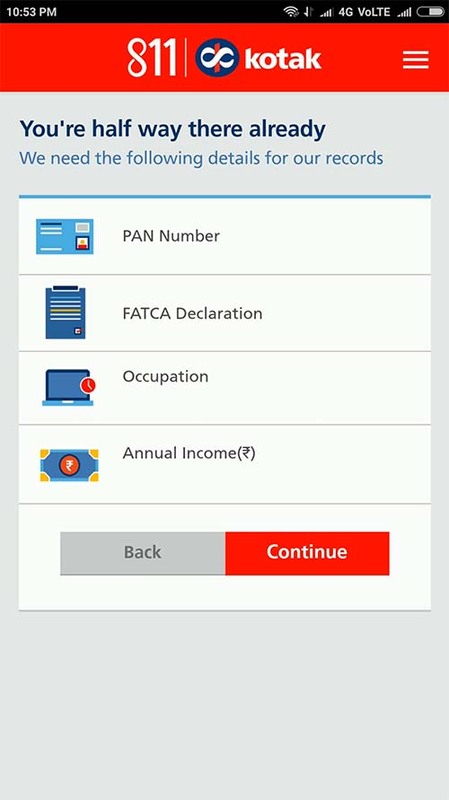 On next screen you will get few details to be completed like PAN Number, FATCA Declaration, Occupation, and Annual Income. So to start entering these details one by one just tap on continue button. After completing all the details on next page you will have to enter few more details like your marital status, mother’s full maiden name, father’s name, your email id, add nominee and tap on continue button. Next you will have to set up six digit mobile banking PIN (MPIN), and click on continue button. 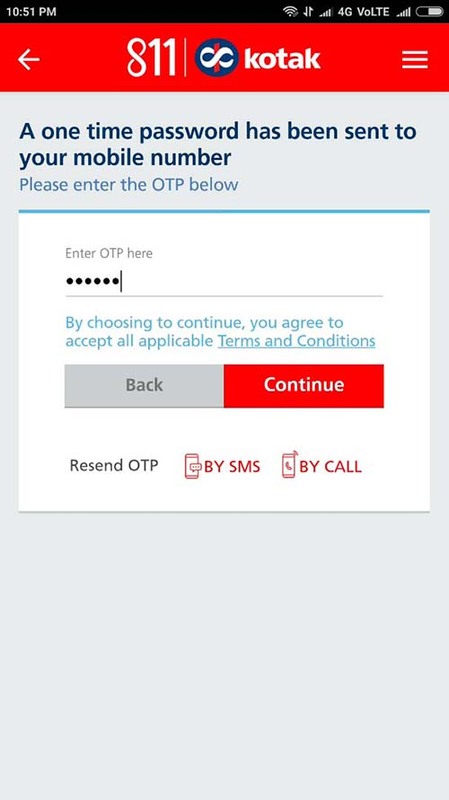 On next page you will have to enter OTP which is sent to your Aadhaar registered mobile number and email id, once you enter the OTP tap on continue button. 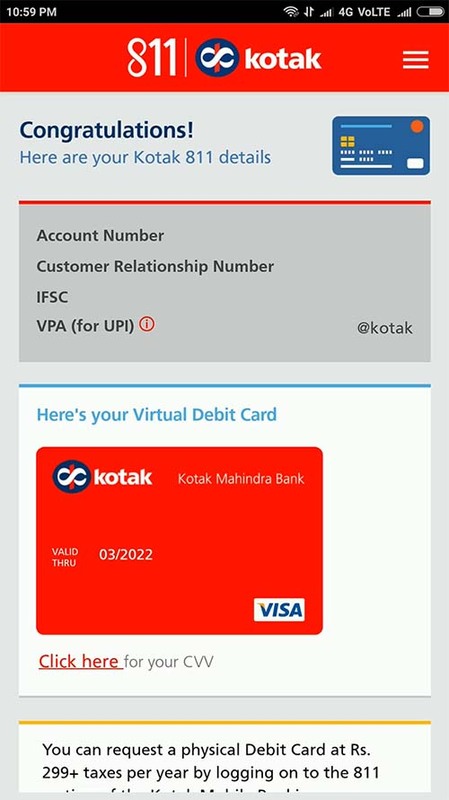 That’s it you have successfully opened Kotak 811 Bank Account and on the next screen your account number, customer relationship number, IFSC Code, VPA and your Virtual Details Card details will be displayed. You have successfully opened Kotak 811 Bank Account Online, and now you can login with the details which you have mentioned. Today i received SMS saying Avoid closure of your Kotak 811 Account with just a fingerprint. Give a missed call to 022-33067171 to fix an appointment & complete Full KYC of your account. I got SMS Avoid closure of your Kotak 811 Account with just a fingerprint. Give a missed call to 022-33067171 to fix an appointment & complete Full KYC of your account. It means now they want forcefully need our fingerprints. Your Kotak 811 Bank Account is completing its validity period of 1 year & will be closed on 22-Apr-2018 due to pending Full KYC. In case you have balance in your account, kindly share NEFT details of your other Bank Account by clicking on //bit.ly/2pHrbmR. Your funds will be transferred within 7-10 working days from the date of closure. If you haven’t provided your other bank details for funds transfer of pending balance, your account will be freezed completely. If you wish to complete your Full KYC and for refunding of the monies lying in the account, kindly visit the nearest Kotak Mahindra Bank Branch.